Hannah joined Yate at the age of 11 years old, training with Kevin Barry as a jump’s athlete. At the age of 13, Hannah started training with Graham Howell and was soon making a good contribution to club team points in the Young Athletes League as an U15. Training with Graham allowed Hannah to focus on hurdles and she steadily improved her performances with some early success with a MCAA Bronze medal over 75mH in 2005. She was also a regular in the Women’s Midland League team. 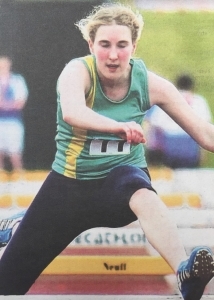 In 2007 Hannah moved up to 80mH and showed an improved strength claiming the club record and being selected for Avon Schools in the English Schools Championships. As an U20, after struggling with the move from 80mh to 100mh, Hannah scored good points for the Midland League Team and in 2010 Hannah made a serious attempt at 400m hurdles. Success came very quickly as she posted good early season times in the Midland league, took a Silver medal in the Midland U20 champs and broke the U20 club record. Selection for the English Schools champs also followed but disaster struck when she pulled a hamstring just a week before the competition forcing her to withdraw from the event. Success in the South West Championships in 2011, saw Hannah compete for the South West Team in Antwerp Belgium, coming 5th in her first international competition. After the 2011 season, Hannah reverted back to 100m Hurdles and became the South West champion in 2012, 2013 and 2014. In 2013 Hannah recorded her best ever 100m Hurdles time of 14.61s when competing for Avon and Somerset at the CAU inter-counties.